Tanacharison or Tanaghrisson (c. 1700? – 4 October 1754) was an American Indian leader who played a pivotal role in the beginning of the French and Indian War. He was known to European-Americans as the Half King, a title also used to describe several other historically important American Indian leaders. His name has been spelled in a variety of ways. 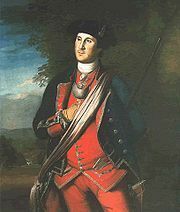 After Washington returned to Williamsburg with his report, Dinwiddie ordered him to lead a larger force to assist Trent in his work. While en route, he learned of Trent's retreat. 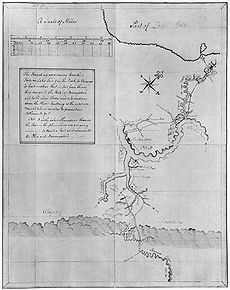 Since Tanaghrisson had promised him support, he continued toward Fort Duquesne, and met with the Mingo leader. Learning of a French scouting party in the area, Washington took some of his men, and with Tanaghrisson and his party, surprised the French on May 28. Many of the French were massacred, among them their commanding officer, Joseph Coulon de Jumonville, whose head was split open by Tanaghrisson. Historian Fred Anderson puts forward the reason for Tanaghrisson's act (which was followed up by one of Tanaghrisson's men informing Contrecoeur that Jumonville had been killed by British musket fire) as one of desperate need to win the support of the British in an effort to regain authority over his people, who were more inclined to support the French.